Very nice, i did not know anybody made those with camber plates front and rear. I much might i ask? No camber adjustment for rear, only front. $1060 shipped. $60 more than I originally paid for the car. Very nice! Thought about bags, didn't want the headache. Maybe another day. Perfect. You also don't have to wrestle with spring compressors to install regular struts and shocks. The last time I did my suspension I used a spring compressor and for that reason alone I will probably get coil overs next time. A straight forward install and unbeatable drive quality. Perfect. You also don't have to wrestle with spring compressors to install regular struts and shocks. The last time I did my suspension I used a spring compressor and for that reason alone I will probably get coil overs next time. Struts + springs was the very first job ive ever done on any car ever, let alone any mechanical task, WOW was I in over my head. Spring compressors are a PITA to use... unless you have an impact gun lol.Without an impact gun its a tortuous, tedious task. 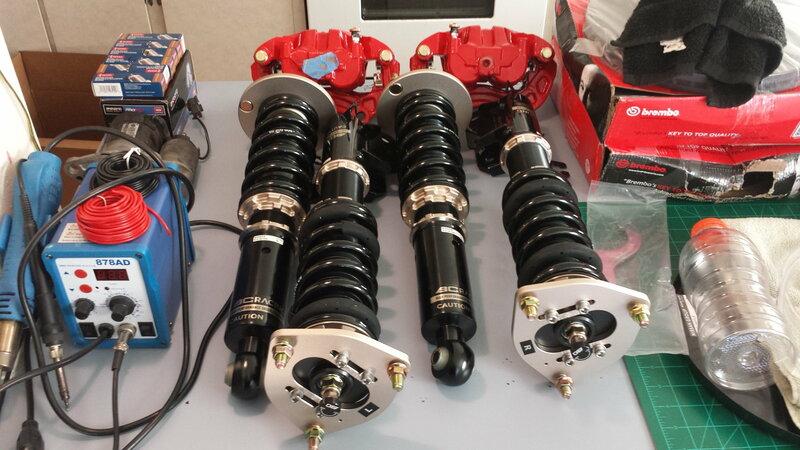 Coilovers are always sweet but they definitely require more fk fk games in terms of adjusting them, keeping them clean, etc. All that being said I like coils. Standard 8k/6k. I didn't opt for the upgraded springs, extreme drop, or any custom spring rates. Having no experience with any of that, I wouldn't know the difference. All I know is I just crossed 3k miles on the car and I'm ready to get off of these S Techs! Looks nice, but no travel in the front warrants a high level of alertness and sticking to known routes so as not to damage the car. I'm looking at getting everything installed this weekend. 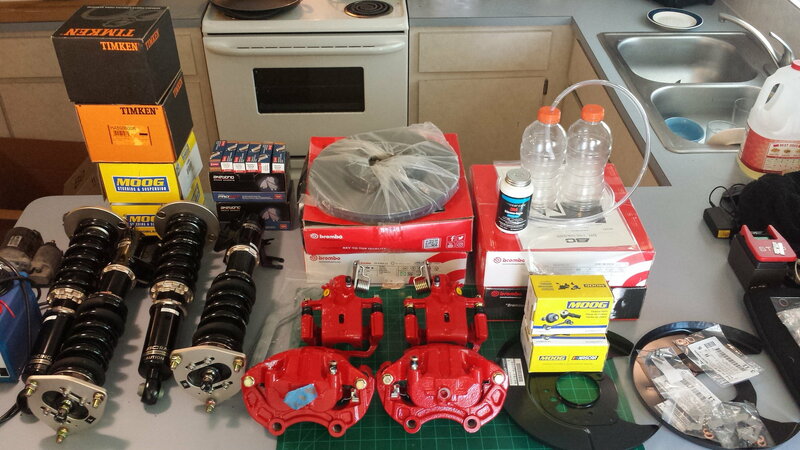 Each of all 4 corners are getting new coilovers, Brembo discs (12.6" 350Z fronts), new (Brakemotive remans) calipers (2008 350Z dual piston fronts), Akebono ceramic pads, new wheel bearing and hub assemblies (Moog rears, Timken fronts, all bearings stamped NSK Japan, the good stuff), new baffle plates (the metal splash guards), and complete brake fluid flush. 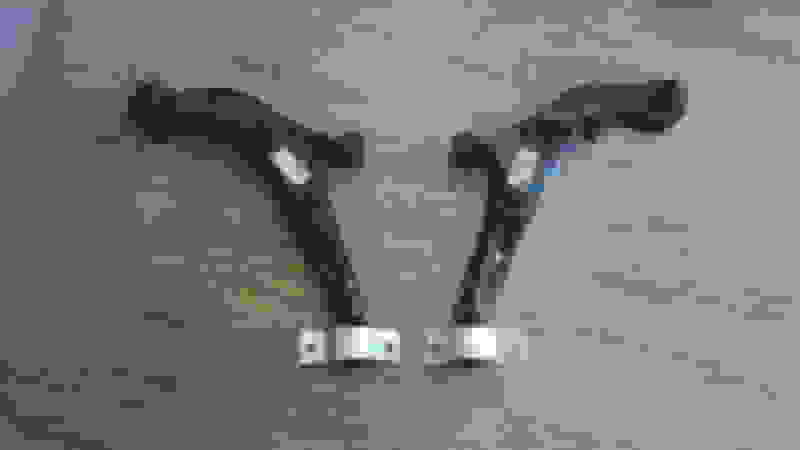 Weekend after I'll replace lower control arms with OEM, Moog sway bar end links, all new bushings for the rear end, and the entire suspension with be completely overhauled. 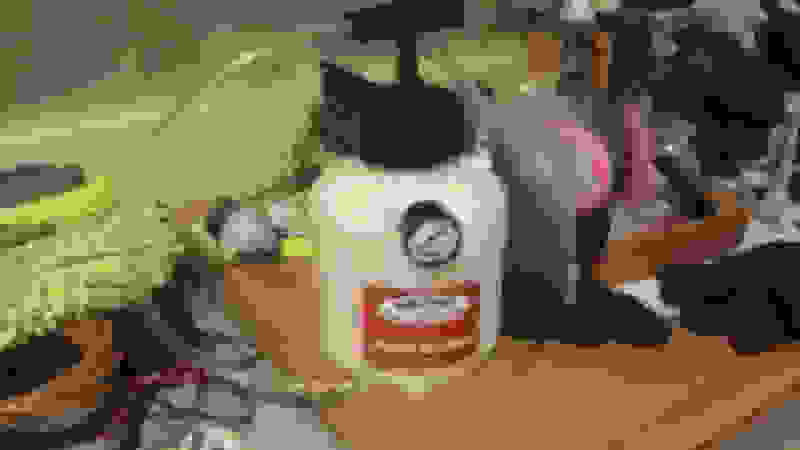 Last edited by User1; 04-03-2019 at 01:38 AM. Stereo. Too much to list In a nutshell, two 12's, 4 way active front stage, coaxials, 6x9's and everything required to power and control all of it. But I won't be running a head unit. 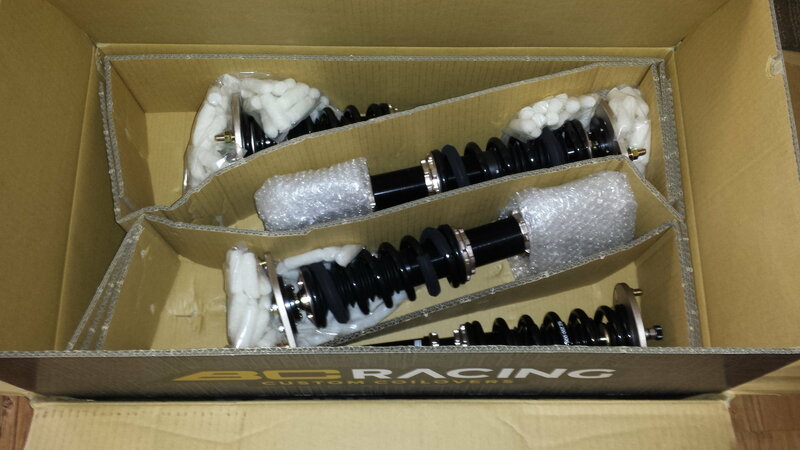 I'll get plenty of photos of the suspension stuff while I'm installing it. Maybe put up a little picture thread. Haven't seen any related threads as of late (last 5 or 8 years anyway). Gotta keep the 5th gen spirit alive! I wrestled those spring compressors together with a ratchet. It was torture. Good point regarding the impact wrench, that would have been a life saver. Hmm maybe I should have gone for those instead of the economy rockauto $55/ pair brand where top plates weren't aligned properly and took a huge amount of wrestling them into place with a friend's help, and now the rears bottom out whenever I go over bumps. $55 a pair? How many miles did you get out of them? Nice! I recently got BC coilovers as well, but mainly to raise my car up a bit due to axle issues. I raised it maybe 1/2" higher than the H-tech drop and voila! No more vibration from the axles. I love the damping/ride on these coilovers as well. whats ur drop look like ? u happy with it? looks like H-tech weren't much lower than H&R maybe by 0.25 inch. Got a lot of work to do this weekend. Still have a few parts I'm waiting for from the dealership. I may even go to an LKQ tomorrow and pull a set of hubs to have blasted and powdercoated then build them up and just install them rather than rebuild mine. Those Brembos are nice. They have a nice coating of some sort on the hat and exposed area. Should keep rust away for quite a while. I gotta pick up a 12 ton Harbor Freight press tomorrow to do the bearing work. SO glad I did inner and outer tie rods while the engine was out. Inners would have been a pain. Driver side was tight. I imagine I could have done some damage to the rack trying to get that one off with the engine in. Got what $2000 or more worth of parts, but a $300 stove...man...you're crazy! But I'm onboard, can't wait to see what this turns into! ...and $2,000 in parts to fix it up? Isn't that how you're supposed to do it? What can I say? I like to save money! 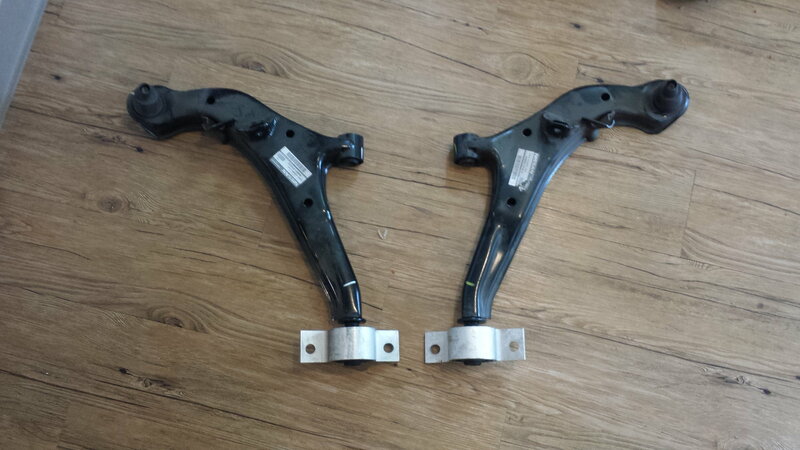 Buy some speedbleeders for your calipers. Makes bleeding your brakes a treat. I'll flush the entire system before any other work is done so that I'm not introducing old nasty fluid into the new calipers. I'm thinking about spraying the coilovers down with Mothers spray wax then throwing these covers on. Also thinking about wrapping a small vinyl tube or something in the top to allow it to breathe. And, is this thing worth it? yes guys have used the protective sleeves in the north east, i would definately do it if ihad coils as well. and wax cant hurt either. the torque kit is worth it if you have decent engine mounts, if not, there's no point, it will tighten up one end per say and then make aged mounts work even harder. there were a few guys who made thier own with just home depot parts. fish eye hook etc etc. if i had new mounts i would have bought the nwp torque link used or something. It's a good concept, but I'm not sure I like the engine mounting point with the NWP kit. I want a mount point farther outside of the torque axis. Trapping dirt and moisture was the first thing that crossed my mind, and why I initially thought the coil covers to be a bad idea. But I'm in Florida, and I don't plan on taking the car off road or through any mud bogs any time soon. I pretty much only need to worry about moisture, hence my very next thought of how to allow them to breathe, like with a tube up top or something. I like the idea of the Chrisman arms (maybe their new official name? ), but the pictures show them to obstruct the area where the lower splash guards would be. Splash guards trump traction bars for me. Still waiting for a few parts to arrive. I went to the yard Sunday morning to pull steering knuckles but there was only one left on the car I looked at and then I realized I forgot my giant axle nut socket anyway so I just robbed some interior stuff and went home. As soon as I pull a set of knuckles, get them blasted, powdercoated and new bearings and hubs pressed in, I'll have everything I need to do the entire suspension overhaul. Also, I had my rotors cut down 2mm. I finally found an awesome machine shop (relatively new in Tampa, so I have no hookups for anything), and he only charged me $40 bucks. So I gave him $60 and said I'll be back! He's got everything and anything I could ever need from a machine shop, and I get the impression this old-timer knows his stuff, so that's a great feeling! is a great deal, adds a piston and almost an inch and a half rotor diameter on each side, is direct bolt-on, and requires only light lathe work for rotor hardware clearance (see below).